Explore our Canary Island surf holiday destinations. Population: 2 million Location: Atlantic Ocean, opposite southern Morocco on the North West African coastMain surf area: Fuerteventura, Lanzarote, Tenerife, Gran Canaria Language: SpanishCurrency: Euro Year round surf: Yes Most consistent surf: September to April Best time for Beginners: Year roundIf you are in need of year round guaranteed 25 degree sun and very reliable surf the Canary Islands should be your first choice. Warmest water - wetsuit optional! 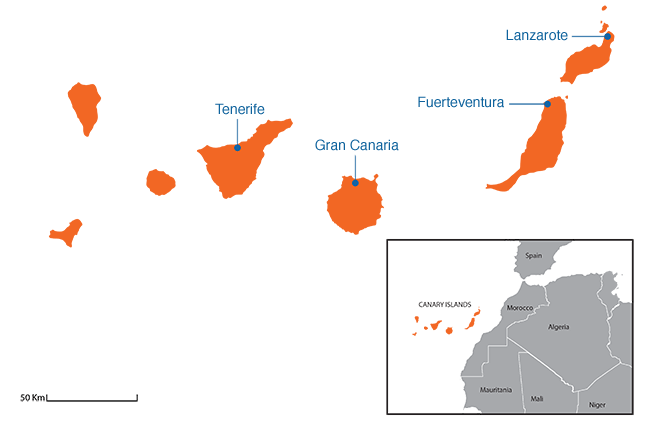 The islands are part of Spain, lie 100 kms from the coast of Morocco and are only a short flight from Europe. Have a browse of the Canary Islands surfing holidays and surf camp options we have and hopefully you will be inspired. Choose your accommodation and add surf school lessons and come join us for a surfing holiday in the Canary Islands. What's the surf like in the Canary Islands? For some, the Canary Islands conjure up images of an A-typical holiday destination, bumping sunburned shoulders with fellow holiday-makers in search of sun, sea and sand. However, the Canaries can serve up infinitely more than year round sun, offering some of the best waves in Europe, that cater to all levels of experience. Kite, surf and body boarders will all find more than enough to keep them happy. From powerful, hollow breaks on shallow reef that demand a refined skillset, to beginner friendly, sand bottom waves that are perfect for learning. Moving between Gran Canaria, Lanzarote, Fuerteventura and Tenerife travellers can opt to surf at well-established spots, or venture further out, to find a wave away from potentially crowded line ups. Like the islands themselves, reef breaks in the Canaries have been shaped from solidified lava, meaning the less careful can take away a new found appreciation of reef rash. At the more renowned spots throughout the islands, localism is a well-established facet of sitting in the line up, so be sure to respect others and play by the rules! The Canary Islands have a great mix of laid back, rural villages and also lively bigger towns. Each has an array of different options for all budgets be it a canary islands surf camp or more luxury options. Being long-standing tourist destinations means that certain areas of each island are very well developed and can provide you with great nightlife, restaurants, shopping and any other amenity you could wish for. Below is your guide to the ‘Hawaii of Europe,’ the key spots mentioned are just the beginning of what the Canaries have to offer, the best way to find your new favourite wave on the islands is to get out and explore! The majority of waves off Gran Canaria, are located at the most northern and southern coasts of the island, giving you a great excuse to get to explore both sides of the island. Public transport on the island is very good with taxi’s, buses and tours running to all tourist spots. Renting a car is a great way to get off the beaten track and on to less crowded waves. One of the most powerful waves that exists on the Island is El Frontón in the North West. This slightly out of the way point break is best in mid-size waves, breaks on reef and is an incredible spot for bodyboarding. Good wave knowledge is essential here as it is not for the inexperienced. Tube hungry surfers will also want to hit El Confital, another heavy wave that breaks in the North East. El Confital is a right hand reef break that has fairly consistent waves, but can become crowded at peak times, so get there early! Las Canteras, in the North East region of Las Palmas de Gran Canaria, is a great beach break, ideally suited to those taking up surfing for the first time, and is just one break of many in this wave rich area of the island. Also in the NE is Medio Ahogado, a tricky right hander that breaks over shallow reef. In front of San Andres town on the central North coast, is Los Enanos, a mixed break of reef and beach that picks up lots of swell and works in the majority of conditions. This is a beginner friendly spot that is the perfect place to learn surfing or slow down and develop aspects of your style. Out of the water, Gran Canaria has lots to keep you occupied. The island is equipped with a host of bars, clubs, restaurants and shops. As well as this, away from the established tourist thoroughfare, parts of the island have also been declared UNESCO Biosphere Reserves. Only 100km from Morocco, Lanzarote has a plethora of surf spots set in stunning scenery to please every travel hungry surfer. The coastline is dotted with a variety of breaks to suit all levels. The best way to negotiate getting to and from the surf in Lanzarote is by hiring a car at the airport. The island is small enough (60KM long and at most 20KM wide) that you will always be close to good surf, and the roads are well sign posted and maintained. El Quemao on the North West coast, breaks in front of La Santa Village and is famed as the Pipeline of the Canaries. El Quemao is a deservedly world famous wave, that should only be taken on by experienced surfers capable of tackling its heavy left-hand reef. Close to La Santa village is Calleta de Caballo, in the bay of which breaks Chicken Left. This wave is less demanding than many of the other reefs on the island and breaks both left and right. Famara is a 6km long beach break with lots of space to surf. It is one of the best beginner beaches in Europe and surrounded by incredible cliffs. The two big tourist towns are Costa Teguise and Puerto del Carmen and are good bases as is Famara and La Santa. Fuerteventura is the longest island but still only 100km in length and at most 30km wide, making a hire car the best way to see all its 150 beaches. Taxi services are also available, but expect the fare to increase with the addition of a surfboard and gear. Corralejo in the north of the island is the main surf holiday town, full of cafés, bars and restaurants. Its a greta base to explore the famous North Shore coastline. The town has some great surf camps on the beaches overlooking the surf. The Bubble is Fuerteventura’s most famous wave, with powerful rights and lefts being produced over a reef bottom, this wave has earned a reputation as a board buster. Adjacent to The Bubble is Hierro Left, a less daunting brother to the Bubble, this is spot generates mid-range waves that are perfect for those venturing out on reef for the first time. There are several spots on Fuerteventura that will produce barrels in the right conditions, Playa del Cotillo is a very consistent beach break that will form perfect barrels on bigger days. Flag beach along the North West coastline is a great beach break for those who want to learn to surf or refine their technique with intermediate surf lessons on Fuerteventura. You’ll be spoiled for choice as the island hosts a large number of well-equipped surf schools. Tenerife is the biggest and most densely populated island of the archipelago. Getting around Tenerife is easy, the island has a reliable bus service and lots of taxi’s. Renting a car is as always the best option, as roads are well maintained and sign posted. Tenerife is bountiful with beach breaks, having them dotted all over the coast. The Bajamar Reefs on the North East get very big on a Northern swell. Breaking over a reef and coral bottom forming different peaks, this wave generates waves suitable for intermediates-beginners on the inside and an outside barrel section for more experienced surfers. Spanish Point on the South East coast is a great left hand reef break for improver to advanced surfers. Punta Blanca in the South East. Punta Blanca, also in the South East, is a slightly out of the way but rewarding left hand reef break. This is a heavy wave for experienced surfers that is world class in the right conditions. The Playa de las Americas area in the West offers a variety of waves to choose from, though it’s popularity means there is a potential for crowding, the vibe in the water is always friendly. The Playa de las Americas is also a great spot to try surfing for the first time, with loads of great schools right on the beach. The sky line of Tenerife is perforated by Mount Teide, the highest mountain in the island chain. The surrounding area of Teide National Park has been marked a World Heritage Site, meaning that even on flat days there is plenty to get you away from the sun lounger and out exploring. Nothing thicker than a spring suit is needed here year round. In summer months a shorty or rash vest and shorts is all that’s needed to keep you happy. Reef rash is a year round hazard however, meaning many at heavier reef breaks choose to stay in spring or shorty wetsuits all year. 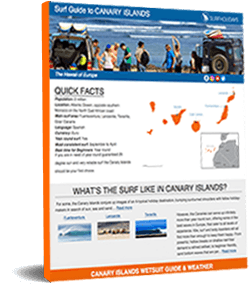 The Canary Islands are well stocked to help you out with any wetsuit, board short or equipment needs you have while over there, so don’t stress too much about bringing every bit of gear you own. The reason the Canaries are famous as a stand-alone holiday destination is because of the outrageous number of sunny days there per year. So summer or winter, you’re guaranteed to get a run of sunny days, another great reason to surf Canary Islands . The summer sun is intensified when spending hours in the water, so skin protection and a tin of zinc are a must for those long sessions!